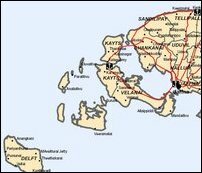 Sri Lanka Navy (SLN) soldiers and Sri Lanka Police cordoned and searched large areas of Mandaitivu, an islet located south west of Jaffna town, from 9 a.m. and 12 noon Sunday, sources in Jaffna said. Mandaitivu residents were barred from leaving the islet the whole morning when the search was in progress, residents said. Residents also said that they have seen a marked increase in harassment of the locals by the SLN in recent days.